The 2, 3 and 5 lines will see service disruptions on the weekends of February 22-25 and March 1-4 and March 8-11. CONCOURSE — Service on the 2, 3 and 5 trains will be disrupted from Friday through the weekend in the first part of a three-weekend construction project at the 149th Street-Grand Concourse station. No 2 trains will run between 3rd Avenue-149th Street in The Bronx and 96th Street in Manhattan. Instead, local and non-stop shuttle buses will operate between those stops. The 2 train will run in two sections during this time — one from 241st Street to the 3rd-Avenue-149th Street station and one from 96th Street to Flatbush Avenue. All 3 train service will be suspended. Instead, the 2 train will make all 3 train stops between 96th Street and Franklin Avenue and the 4 will make all 3 station stops between Franklin Avenue and New Lots Avenue. A shuttle bus will run between 96th Street and 148th Street. The 5 train will not run between East 180th Street and 149th Street-Grand Concourse. Instead, a shuttle bus will run between 3rd Avenue-149th Street and 149th Street-Grand Concourse. 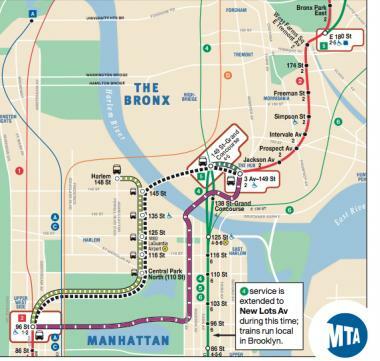 The 5 train will run in two sections during this time — between Dyre Avenue and East 180th Street and, at 20-minute intervals, between 149th Street-Grand Concourse and Bowling Green. The work will continue on the weekends of March 1-4 and March 8-11. In addition to the 149th Street-Grand Concourse station improvement project, MTA workers will be doing track maintenance at 96th Street and tunnel lighting work in the Harlem River Tube on these weekends. Visit www.mta.info or call 511 for more information.